It’s time for the challenge of a new area. 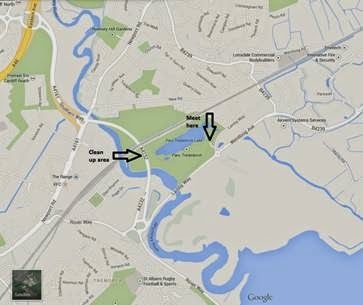 This Saturday at 12pm we will be cleaning under the Southern Way flyover adjacent to the River Rhymney. To get there, we will meet at Parc Tredelerch (look out for the purple truck in the car park). The entrance to the park is opposite the Lamby Way tip entrance. See Facebook for photos of the signage to look out for. The park as a whole is fairly clean and well maintained, so will be quick to sort out. There is then a fair walk to the main clean-up area where there are a number of places to tackle. We are hoping to attract a sizeable group of volunteers as there is much to do in this area. There is limited car parking. Extra car parking is available 300m from Parc Tredelerch in Lamby Way industrial estate which is quiet on the weekends, and hides its own horror stories in terms of fly tipping. As usual, all tools and equipment will be provided and Cardiff Council Parks Services will remove all rubbish. Please wear warm, waterproof clothing in case the weather is poor.